As a paying customer at Platform IQ, you can open a support case with us if you’re in need of our assistance. Our support team will handle Urgent technical issues, Non-urgent technical issues, and Business issues. Please read the article explaining our response time policy for each of these three types of issues. Do you have a tutorial for new Revive Adserver users? Yes, our partners at Aqua Platform have an excellent tutorial to help you Get Started with Revive Adserver. Is there on online uptime dashboard? We collaborate with our partner Aqua Platform to provide all technical facilities. You can view a real time status dashboard of our hosting platform and all of the individual components. The real time status dashboard is operated by a third party, independently of our hosting platform. You can visit https://status.aquaplatform.com at any time, even if you think the hosting platform is unavailable, to see if there is any kind of ongoing issue with the platform. We recommend bookmarking this page or adding it to your favorites so you can open it at any time. Is there a Twitter account for status updates? The engineering team at Platform IQ post status updates on Twitter on the special account Aqua Platform Status. If you follow this account, our status updates will appear in your own Twitter time line automatically. How can I change my Timezone Preference? By default, when you open a new Revive Adserver hosting account with us, it is set to timezone UTC (Universal Time Coordinates), also known as GMT (Greenwich Mean Time). If you want to manage your campaigns or review your statistics in your own time zone, you can do that by changing a preference for your account. If you need extra usernames for your account, you can request them by opening a case here. For each username you need, please provide the first name, last name, and e-mail address of the person. We do not allow group or alias users, since this interferes with security audit trails. There is no maximum for the number of usernames for your account. Can I create a username for my advertiser or publisher? A wizard appears that enables you to enter the details of the new user. Follow the steps on the screen, and don’t forget to save the data you entered on the very last screen of the wizard. Is there a maximum number of sites for our pricing plan? No, you can use one, two, or as many websites and zones as you would like, with any pricing plan. How soon will a new banner image appear online? When you upload a new banner image, it will be be available for ad delivery immediately. Can I move a campaign from one advertiser to another advertiser? The campaign will be moved to the target advertiser immediately. 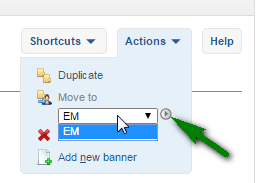 Can I link more than one banner at a time to an e-mail zone? Unfortunately, it is not possible to have more than 1 banner linked to an e-mail zone at any given time. Since e-mail software like Outlook or Gmail does not accept cookies, this is impossible in an e-mail display, and therefore ad servers have to resort to a “one banner at a time” model. That way, when a banner is clicked, they can just look at what banner exactly is linked to the zone, knowing that it must by definition by the one that was displayed previously, and use the landing page URL of that banner for the visitor. We realize this is unfortunate, but there’s nothing we can do about it, since we do not have any control over how e-mail software works. How often will ad statistics be updated? The ad delivery platform collects the data for ad requests, ad impressions, ad clicks and conversion over the course of each hour. A few seconds after the end of each hour, a process is started to collect, summarize and process the raw data and convert it into statistics. The statistics for the hour that just ended will be available a few minutes after the top of the hour. What is the difference between an ad request and an ad impression? In your statistics, you will find a column labeled Requests and another column labeled Impressions. This article explains what each of these metrics mean. When a visitor of your site opens a web page that contains your zone invocation code, the browser will download the page and thus also receive these invocation codes. The browser will execute the invocation codes, and for each of the zones, an ad request occurs. Each ad request is received by the ad server, and counted. The ad server then processes the ad request, and selects an ad based on the delivery algorithm inside the ad server software. The resulting ad code is returned to the browser. The web browser renders the ad code, which means it is displayed so that the visitor can view the ad. Along with the ad code, the ad server has also returned an invisible pixel, called an impression log or impression counter. The fact that this invisible pixel is displayed sends a signal back to the ad server. The ad server then counts an ad impression. How does Revive Adserver measure ad requests and ad impressions? a person opens a page on your site, and that page happens to contain a piece of Revive Adserver invocation code. for the sake of simplicity, let’s assume for now there is only a single invocation code on the page. that execution sends a request to the Revive Adserver installation, and it is counted as “an ad request“. the ad server processes the request and selects a banner. as a response to the ad request, it sends back a block of HTML code presenting that banner to the browser. the browser “renders” the HTML code, which means that the banner gets displayed in the browser. what also happened is that the ad server attached a small, invisible, 1×1 transparent pixel to the HTML code it returned to the browser. This is the “logging pixel“. the logging pixel is technically a small image, and the fact that the browser also renders that, means a call goes to the ad server to say: “count an ad impression“. The process above also occurs if the invocation code happens to be outside of the visible part of the page, so outside the “viewport”. An impression is not the same as a viewable impression. Revive Adserver does not measure viewability. Why are there more ad requests than ad impressions? In some cases, you may find that the number of ad requests is higher than the number of ad impressions. This article provides some of the most common causes for this type of discrepancy. It is not uncommon for site visitors to click on a link to move to a new page or a different site before all the ads on a page have completed loading. This will result in a situation where the ad requests have already happened, and have been counted, but not all ad impressions. The reason is that an ad impression will only be counted when the banner has actually been delivered to the browser. Most commonly seen with video ads, there may also be a situation where a web page or video player sends a request to the ad server for it to select a banner. However, when the site visitor does not engage with the video content (for example does not click the Play button), the video ad is never played and thus an impression will not be counted. When a web page calls a zone that doesn’t have at least one banner with linked to it that has no delivery rules, the ad server will return an empty result set. The effect is that a request will be counted and a blank impression. In case the web developer is using Revive Adserver’s single page call, the cause of a discrepancy can be that the ‘head’ of the page sends a call for all known zones of a website to the ad server, but the page itself only displays a subset of these zones. The effect is that an ad request will be counted on the zones that are part of the ‘head’ call, but those zones will obviously never have an impression. There is a page with a detailed description of Platform IQ Privacy Policies and GDPR compliance on our website. With the release of version 4.1.4 of the Revive Adserver open source software in late May 2018, there are now two new options to help our clients with their GDPR compliance. Please refer to the blog post with the Release Notes about Revive Adserver v4.1.4 for more detail. If you’re a Revive Adserver hosting customer at Platform IQ and would like one or both of these settings enabled for your account with us, please open a support case. Is there a way to detect or bypass ad blockers? A common way to generate revenue to enable you to create and maintain a website, is to display advertising. Not everybody appreciates advertising, however, and visitors often use an ad blocker. We sometimes get questions from people asking if it is possible for the Revive Adserver software to work around those ad blockers. The answer is, unfortunately, no. However, there are ways to detect if an ad blocker is in use, and then to ask visitors to disable it, or to at least whitelist the site they’re visiting so that advertising will be displayed there after all. If you run your site using WordPress, you could use the Ad Blocking Advisor plugin to display a message across the top of the page. We haven’t tested it ourselves (we don’t use ad blockers, for the obvious reason that people working in the field of online advertising would be real hypocrites if they’d be using an ad blocker), but the plugin has very positive reviews. Well worth checking out! Please note we won’t be able to provide support for this WordPress plugin.